American walnut table, with a solid top, ridged sides and legs, with the 'ghosts' of a Queen Anne table cut within the square body of the legs. 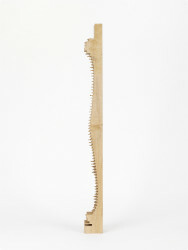 Sold American Walnut Legs & Rails Cut by CNC Router with 5mm Cutting Blade. Veneered American Walnut top. Drawn On Rhino3D. Tradition Mortise and Tenon joints on the frame. The frame is clad with mitred solid. Material Sourced from Tyler Hardwoods Wiltshire. Finished with Liberon Finishing Oil. 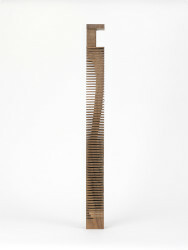 Anne, Gareth Neal, 2008, Crafts Council Collection: W162. Photo: Todd-White Art Photography. This piece was a pivotal moment in the direction of my work 3 years after moving to London and starting up a workshop in Hackney Wick, I started to learn 3d software and return to making objects in wood rather than combinations of materials. I was also keen on making statement pieces and include narratives about the making process and how we have lost touch with certain aesthetics. The combination of these elements and many more including feeling content in my life resulted in the Anne Table.